Paula Gerbase, Brazilian by birth and English by adoption. Nomadic and creative, addicted to detail, tailoring and fabric construction. After attending the St. Martins she enters the world of masculine tailoring in which she grows and develops a strong sense of aesthetics linked strongly to the English tradition. 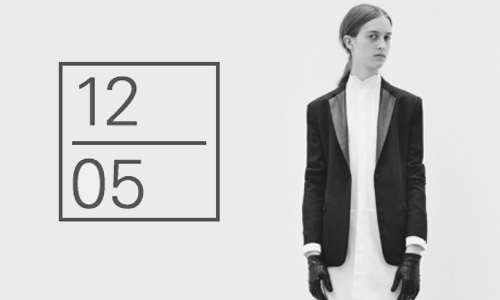 She pursues a unisex style concept through her brand 1205. We got to know and found out her amazing world. I don’t think I ever made a conscious choice to become a designer, I simply never considered anything else. I have been observant from a young age, and have always had a heightened sensibility to details, be it from food, colours, smells, the built environment, and of course clothing as well. When did you decide to leave Savile Row and star your own brand? I studied Womenswear at St Martins but at the same time was looking for a more traditional type of training, so I started an apprenticeship at the Womens Tailoring atelier of Hardy Amies while I was still at college. From there I went to work with one of the coat makers at Kilgour, also on Savile Row, where I learned in a more traditional way how to cut and to put garments together. The contrast of the creative environment at St Martins and the very strict and respectful mood of the tailoring workshops felt right for me, and I still play with those ideas in my work for 1205. 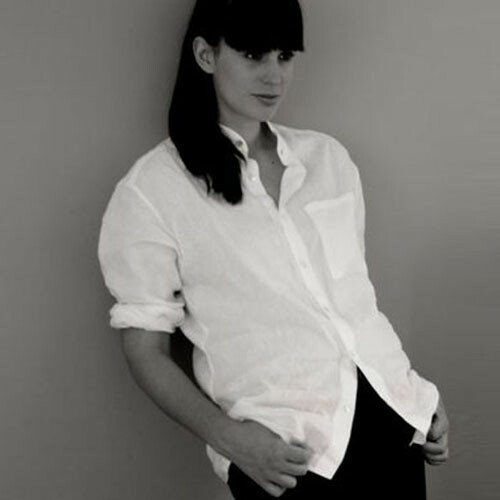 I had been working as Head Designer at Kilgour on Savile Row for 5 years, I had started while I was still at St Martins, and I felt that it was time to begin a project that would use the knowledge and experience I had taken in Savile Row, but to go back to my Womenswear roots. 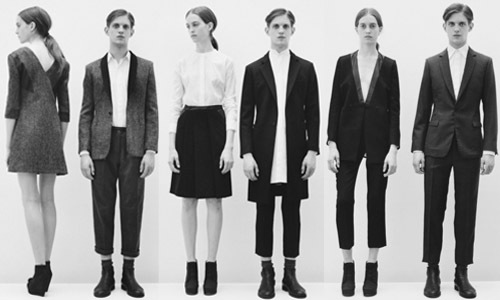 The idea was to make a collection which contrasted those two polar opposites, and it was a way for me to experiment with the idea of a capsule tailoring Unisex wardrobe. 1205 started from that, and I continue to explore the lines between femininity and masculinity by playing with fabric, texture, cut and proportion. Which were the first stapes took when you started 1205? The most important thing was to develop the collection and to understand exactly what I wanted to express. I had a very clear vision to what I wanted the garments to be, and so the next step was to begin cutting and defining the silhouettes, shapes and proportions that would honour my tailoring background but also compliment both feminine and masculine bodies for the Unisex aspect of the collection. 1205 is simply the day I was born (12th of May). To me it signifies the beginning. A fresh start, which was what this project was to me. I wanted something that meant the same thing in all languages and everyone could in fact say in their own language, so that it became personal to each person, just like hopefully each person can wear the clothing in their own individual way they can also say 1205 in their own individual way. There is also a certain anonymity with a name of just 4 numbers which I am more comfortable with. The brand should not be about me, it should be purely about the clothing. How did you design the first collection? As always, fabric, cut and proportion play an important part in my design process. I see the collection as one whole, seen as a spectrum. At one end are the more masculine pieces, at the other and are the more feminine pieces, and in between a real play between the two. This process allows me to play with more or less exaggerated proportions, or more or less strong textures and details as you move between one end to the other. This means that there are no real boundaries between the menswear, the womenswear and the unisex parts of the collection, it is up to the observer to make up their own minds. The AW12 collection was inspired by the years of my childhood that I lived in the USA. We lived in Maryland near the Amish communities, and many weekends would have meals at Amish houses. Their way of life always fascinated me and their traditionalist minimalist aesthetic had a real impact and stayed with me. The simplicity of their surroundings and way of life inspired the collection, which used hand made fabrics like Harris Tweed and Swiss cottons. 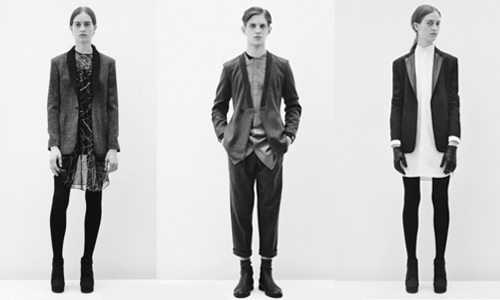 Tell us about this fall-winter 2011-12 collection. This is your first season as 1205m it’s an important begins. For Autumn/Winter 2011 the Shawl Collar Blazer is definitely very representative of the collection, and of 1205’s aesthetic. The focus on a traditional fabric but very pure cut and details represent the concept of the 1205 collection very well. It can also be worn by men or women. The Blazer comes in Harris Tweed or a Wool mix knitted fabric, both fabrics which were very important to the collection this season. Your past experiences are within tailoring. What do you think about fast fashion and phenomena like Zara or H&M? I have always worked with the more crafty aspect of clothing, so fast fashion is not something that I am extremely familiar with, or that I relate to. My design process is essentially focused on thoughtful cut, high quality fabrics, considered details, and construction. I do think that the Zara’s and H&Ms serve a purpose, but I also feel that they have put such a ridiculous amount of pressure in the timings and turnaround for products in the industry, with various seasons and sub-sesonal product drops, that it becomes harder and harder for anyone to make high quality garments and develop well thought through ideas. The culture of fast fashion has also started to impregnate other ‘higher’ parts of the industry. I have consulted in the past for various other brands and unfortunately it seems that the design of an individual identity and development of high quality products is being put aside in favour of an easier, safer strategy led by the bottom lines and profit margins. I don’t think that the latter way of working leads to timeless product or new concepts and ideas. Which arte the inspirations for the next season? Spring-Summer 2012 was about injecting an element of movement into the collection. I introduced certain classic sportswear fabrics but handled them in a very formal way, so we have a super lightweight perforated polyester formal shirt or a fleece Tux jacket. It was about inserting the unexpected texture or detail into a classic tailored garment. The summer collection will be presented in Paris in our private showroom during Womens and Mens fashion weeks. The Winter 12 collection will also be presented in Paris. We are getting ready to present the new AW12 collection in Paris, and developing a first line of leather accessories.We are also continuing to work on developing our London workshops, which is an ongoing project. All 1205 products are made in London and this is a particularly important part of our aesthetic which I am keen to continue to develop further and further.